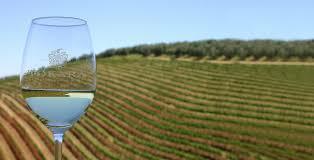 A visit to South Africa would not be complete without spending time in historic Cape Town and exploring the internationally renowned wine growing region. After all, this area is where the Dutch ships stopped on their way from Europe to the “Spice Islands” of Indonesia, giving rise to the Dutch East India Company founding the Cape Colony in 1652. In our opinion Cape Town is one of the most beautiful coastal cities in the world, nestled in the shadow of Table Mountain. We rented a car and our 12 day, 750 mile (1,200km) trip took us through the stunning wine growing region, parts of the Garden Route and ended with some of the most spectacular coastal scenery we’ve ever seen. 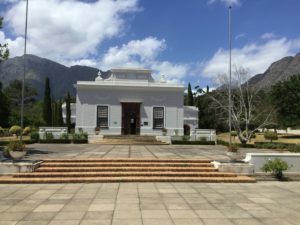 Our first stop was the town of Stellenbosch, one of the key towns in the Winelands and home to the oldest University in South Africa. At the suggestion of our Airbnb host we chose the Mont Marie Wine Estate for a delicious brunch on the patio (freshly squeezed orange juice and scrambled eggs with smoked salmon on a croissant … yummy!) A short distance away was the Waterford Wine Estate where we sat under the trees for a relaxed wine tasting followed by a cellar tour. Joining us on the cellar tour was a young couple from Port St. Lucie, Florida! It’s a small world! 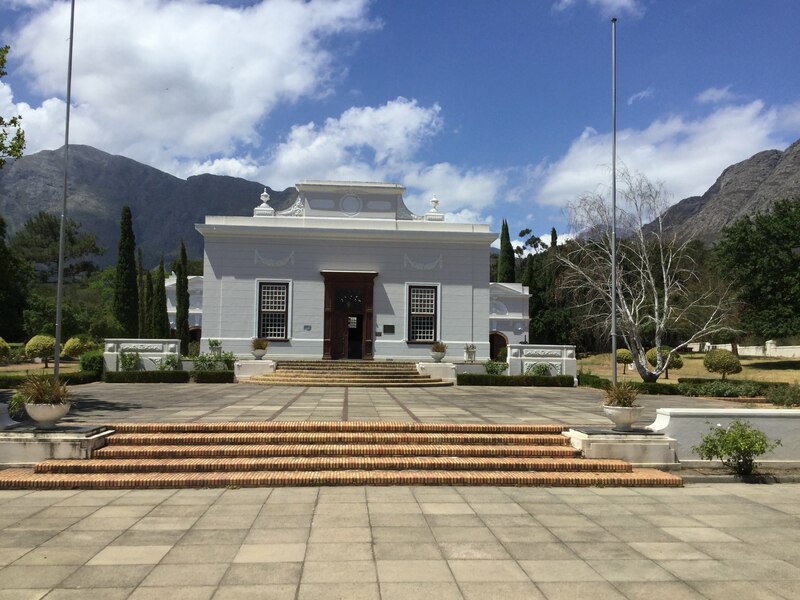 Stellenbosch is a lovely walking town with oak shaded streets, plenty of fine restaurants, upmarket shops and beautiful Cape Dutch buildings. The day we were there the students at the University were starting Orientation and the Schools had returned after their summer holiday so it was very crowded and had a vibrant atmosphere! After a busy day we were happy to return to our Airbnb in the suburbs and relax on the patio with a glass of excellent local wine! 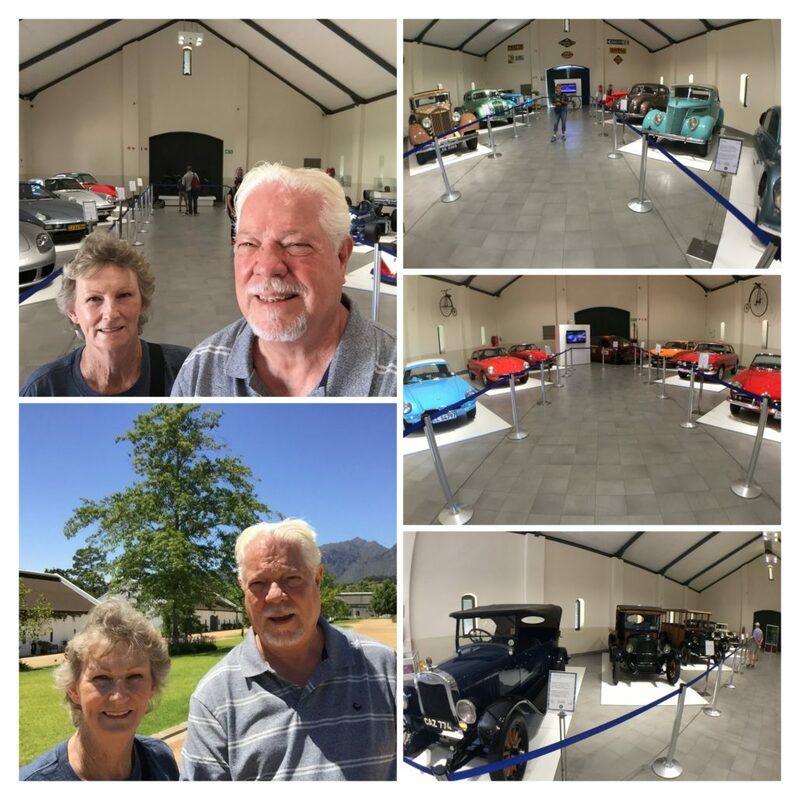 Franschhoek, known as the gourmet capital of the region, was our next stop – not so much for the food and wines but because of the Franschhoek Motor Museum at L’Ormarins Winery! The beautiful grounds contain four large temperature-controlled buildings showcasing a spectacular collection of 80 cars as well as motorcycles and bicycles from the last century and beyond. Bill was in his element and it was difficult to pry him away! To learn a little more about the region we stopped at the Huguenot Museum featuring the important part played in the development of this area by the French Protestants who fled France in the late 1600’s to avoid religious persecution. 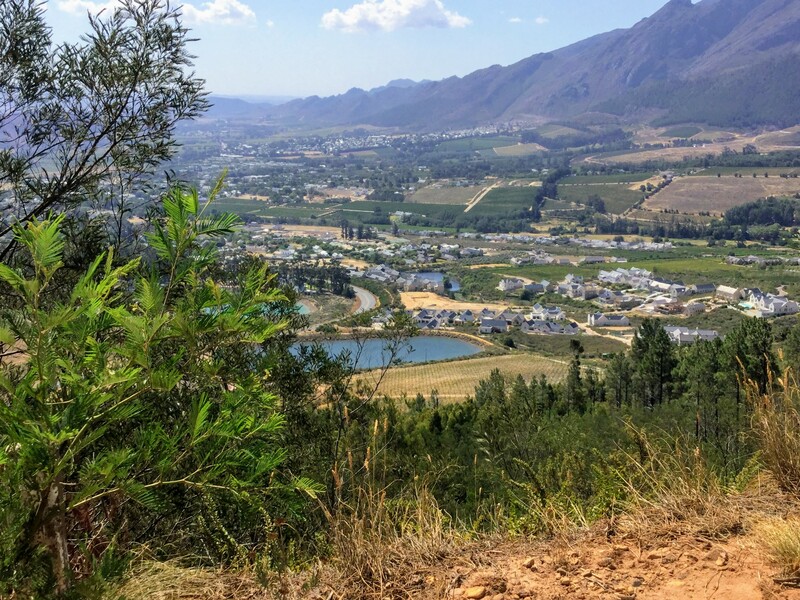 Once settled on the land provided for them, they imported vines from France and the area became known as the “French Corner, or “Franschhoek” in the Dutch language. We had an interesting conversation with the man at the front desk who explained that he is a descendent of slaves brought from Malaysia and Indonesia to work on the farms. He was attempting to trace his ancestry but this was impossible because slaves had their last names changed when they arrived in South Africa. His last name is now “Friday”. He showed us records of the original Huguenot farmers detailing the number of vines they had, also the number of slaves. 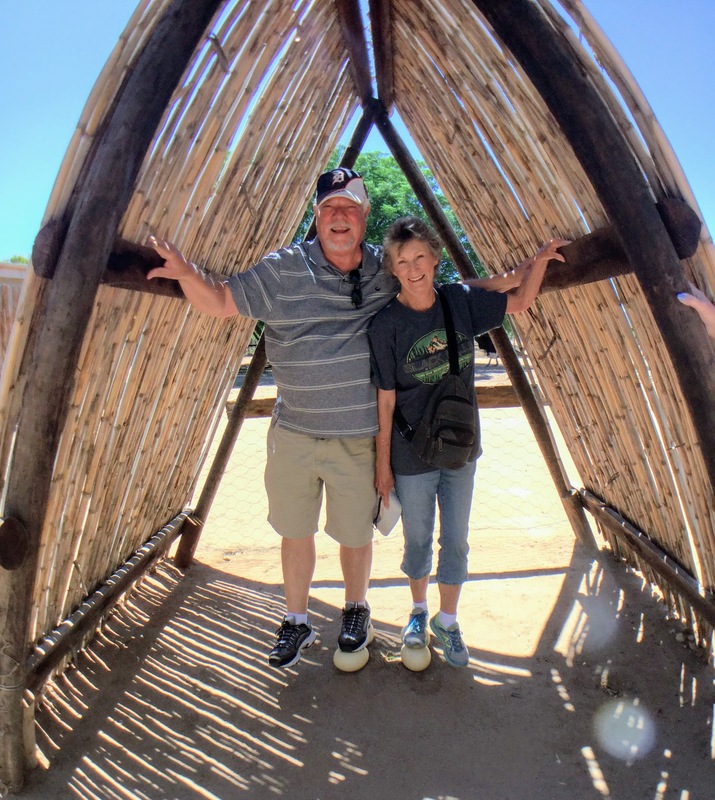 We learned that the immigrants had been given provisions and farm tools when they arrived which they had to pay for once they started making money so meticulous records were kept. What a treasure these records are today! 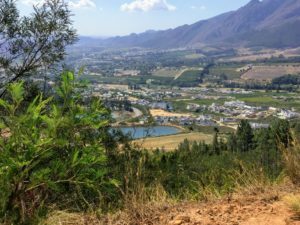 We were in store for an amazing scenic drive as we left this picturesque town and drove over the Franschhoek Pass giving us a birds’ eye view of the valley below and the mountains beyond. The road took us through stunning mountain passes, vineyards, orange groves and a crop that we didn’t recognize which turned out to be hops! Yes, Craft Beers are making their mark throughout South Africa. Our destination was Montague , a small town on scenic Route 62 that maintains its laid back charm due, in part, because it was bypassed by the railway. Thanks to our B&B hosts, Chris and Cheryl Sherwood at Peace Cottage we fell in love with this small town surrounded by the Langerberg mountains. 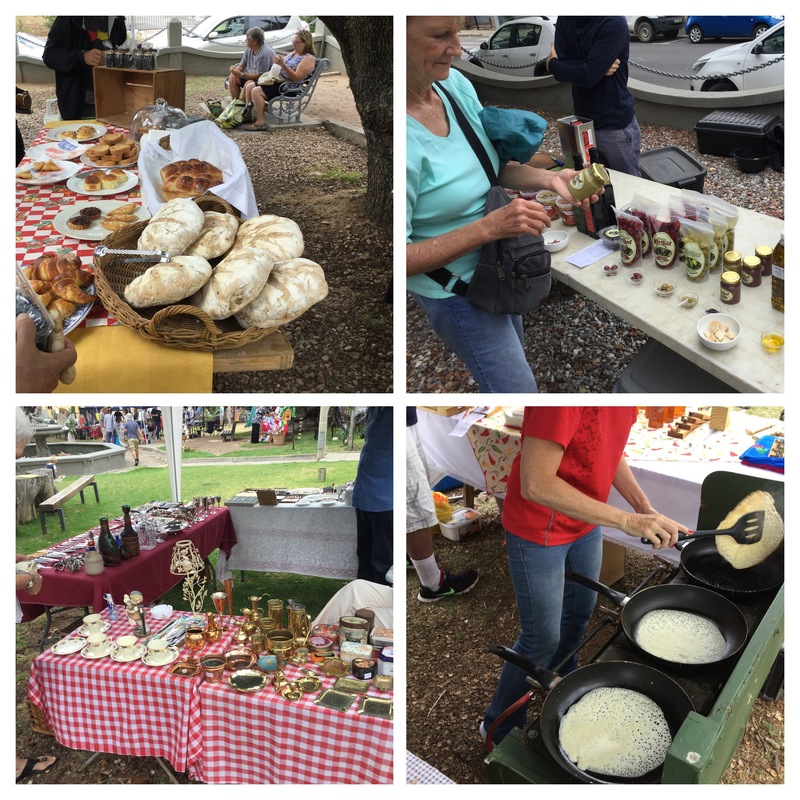 We were there for the Saturday morning market where we met some of Chris and Cheryl’s friends and Cheryl drove us around the small town which still has the feel of a Victorian agricultural village. It’s no wonder Montague is becoming popular as a retirement area! Although we spent our time here relaxing and enjoying the town, there is plenty to do in the surrounding area: fishing and boat trips on the Breede River or, for the adventurous, mountain biking, paragliding and more. 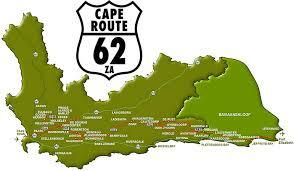 We wanted to stay longer but our schedule didn’t allow it so we continued to Oudtshoorn. Thanks to the fashion demand for ostrich feathers from 1860 – 1914, our next destination, Oudtshoorn (pronounced ‘Oats-horn’! ), became the ostrich capital of the world and created tremendous wealth for the “feather barons”! 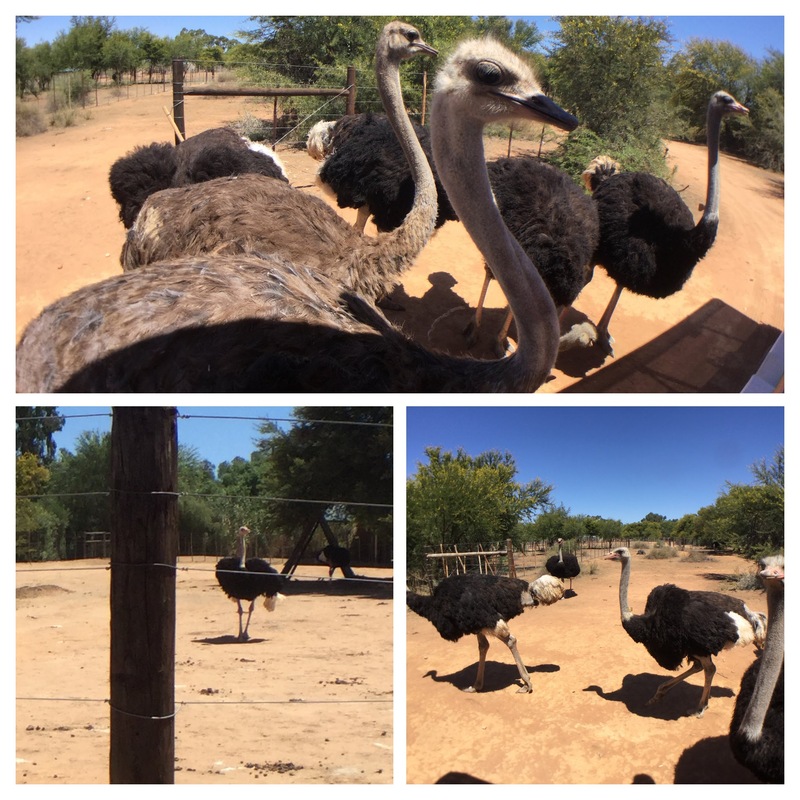 Oudtshoorn is the place to learn about and interact with ostriches. We chose to visit Safari Ostrich Farm because it is a working farm and although you get to feed the ostriches there is no riding on them like some other ostrich tourist attractions. During the tour we stood on some ostrich eggs which shows how strong they are! Check out some fun facts about Ostriches here. Today an Ostrich farmer can make a considerable income from selling the meat which, by the way, is delicious and has lower fat and cholesterol than other meats. The hide is in high demand as it produces resilient, soft leather perfect for handbags, shoes, clothing, etc. The eggs and the feathers are sold as well. And don’t forget the entrance fee charged to tourists! We paid $12 (ZAR 140) each and saw a couple of large tour buses arriving as we were leaving!